ST. LOUIS IS BASEBALL HEAVEN! Everyone that knows me knows I love baseball, especially Cardinal’s baseball. It is hard to live in St. Louis and not get addicted to this fabulous sport. I have always loved sports—particularly college sports like basketball but once I moved to St. Louis, I became addicted to Card’s baseball. I moved to St. Louis in 1976 and quickly became a loyal fan. I remember my first Championship game in 1985 and all of them afterwards and most definitely the opening of the new stadium and the Build-A-Bear Workshop store in 2006, another championship year! I have always followed sports as a business leader because I admire winning coaches and I like to learn from them. My favorite Cards coach, Whitey Herzog was just inducted into the Baseball Hall of Fame and his jersey #24 retired from the Cardinals. This weekend celebrated that championship 1985 season. Lately I have heard a few people say that St. Louis is about baseball, beer and bears 🙂 Wow!! For BABW to be in the company of such great brands as The Cards and A-B is truly an honor. Today was the perfect day too—it was Build-A-Bear Workshop day at Busch Stadium, the epicenter of baseball heaven, and we gave a way a collector bear wearing a 1985 Card’s jersey. 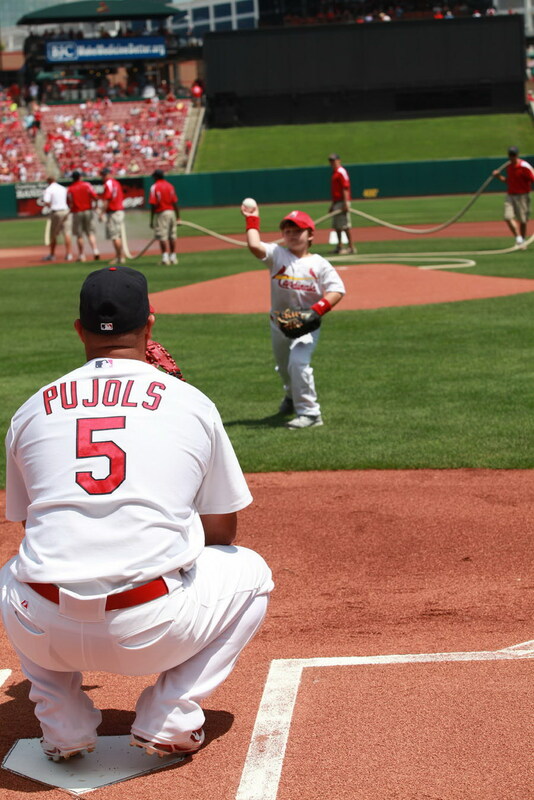 It was also a day to celebrate our partnership with the Pujols’ Foundation. 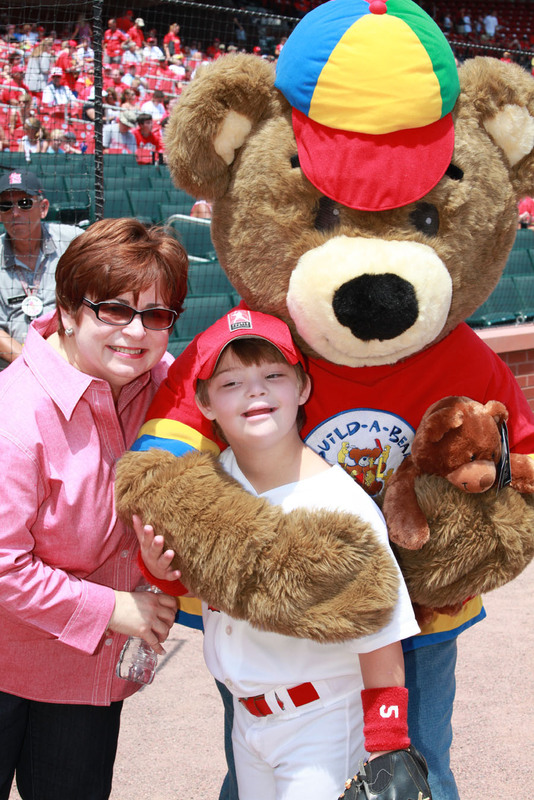 We have a special bear—the Pujols’ Bear that sells in St. Louis and $5 of the price goes to the Pujols’ Foundation which supports children with Down Syndrome. Of course, this is a cause near and dear to my heart because this was my Mom’s passion as well. To tie into BABW Day we welcomed a special Down Syndrome boy, Bret, to throw out the first catch and Albert Pujols was his catcher. This week was also Bret’s birthday so he was on cloud 9. Al-beart is a great hitter and catcher too! The Cardinals are a championship team because the win games but they also win hearts with their great Cardinal’s care program and their outstanding coaches and players with heart like Albert Pujols. Both the Cards and Albert use their fame to influence causes and the well being of others. Both Albert and his wife Deidre are committed to the community and especially to these terrific children. They are thankful for what God has given them and they give back to others and in so doing set an example of what a true champion is—a winner, inside and out! 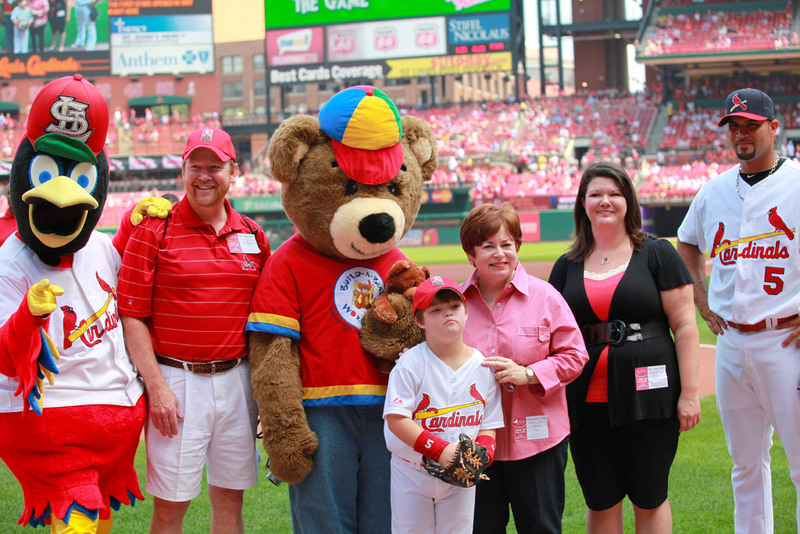 Fredbird, Bearemy, Bret , Albert and their fans! I am always motivated by the heart of others—thanks to the Cardinals and the Pujols Foundation for shining such a bright light on St. Louis and seeting an example for what a champion is first and foremost—a person with HEART!! I think his name should be ALBEART! You are currently browsing the Maxine Clark's Blog blog archives for August, 2010.